I have to say, it was an expensive trip – I’ve never paid so much for a long weekend! – but it was worth it. After loading up on duty-free champagne and whisky at Heathrow, I suggested to Amanda, Jackie, Susannah and Jason that we start off with a champagne breakfast at the Oyster Bar, and they were easily convinced. When you’ve spent so much money already, you might as well push the boat out! Kiruna is the most northerly airport I’ve ever flown to, and it wasn’t the only personal milestone I set. After standing on the Equator for the first time and then climbing to the highest point I’d ever reached at the summit of Mount Kenya, I went on to endure the coldest temperature I’ve ever experienced (-35ºC!) and visit the Arctic Circle for the first time. After a coach ride by the light of the other-worldly, pink ‘Alpenglow’ you only find in the far north or at altitude, we arrived at the Icehotel. We had all booked different activities for each day, but I wanted to avoid the check-in tailback at reception, so I started off by checking out the hotel itself. To call it a hotel is not really fair. It’s more like a village, in which the bit made out of ice is only a small part, alongside dozens of wooden chalets and outbuildings. It is more like Portmeirion, the setting for the cult Sixties spy series The Prisoner – except with everyone wearing snowsuits instead of black and white blazers. Most people know it from the James Bond film Die Another Day, but the scene wasn’t actually shot there. Having said that, you still get the snow and ice and the frozen river – all that’s missing is Halle Berry and the Aston Martin with the built-in rockets and machine guns! 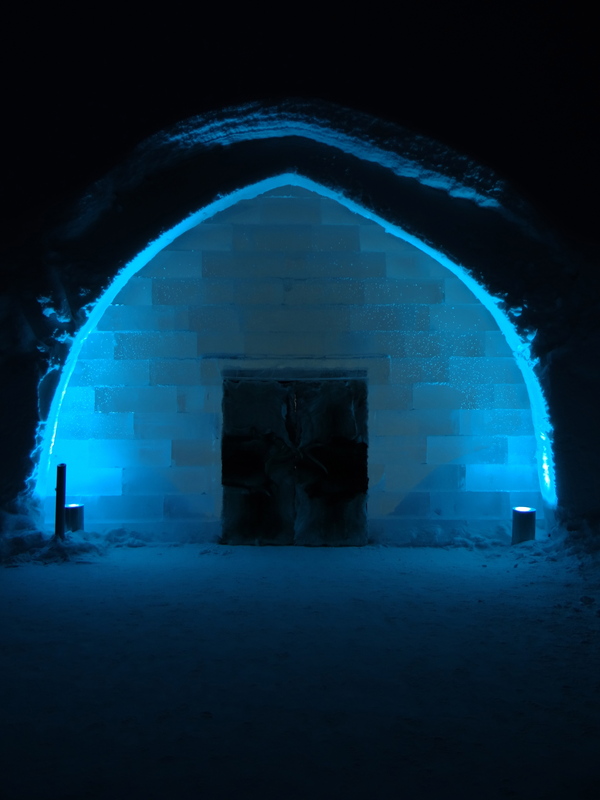 The hotel itself has been around since 1990, when French artist Jannot Derid held an exhibition in an igloo in Jukkasjärvi. Unfortunately, some of the guests couldn’t find rooms in the town, so they were allowed to stay overnight in the exhibition hall – and the legend was born. The first purpose-built ice hotel was built the following year on the Torne river out of ‘snice’ (a mix of snow and ice) from its crystal-clear waters, but it promptly sank! Since then, it has successfully expanded and now accommodates thousands of guests each winter before melting in the summer months and being rebuilt in October. 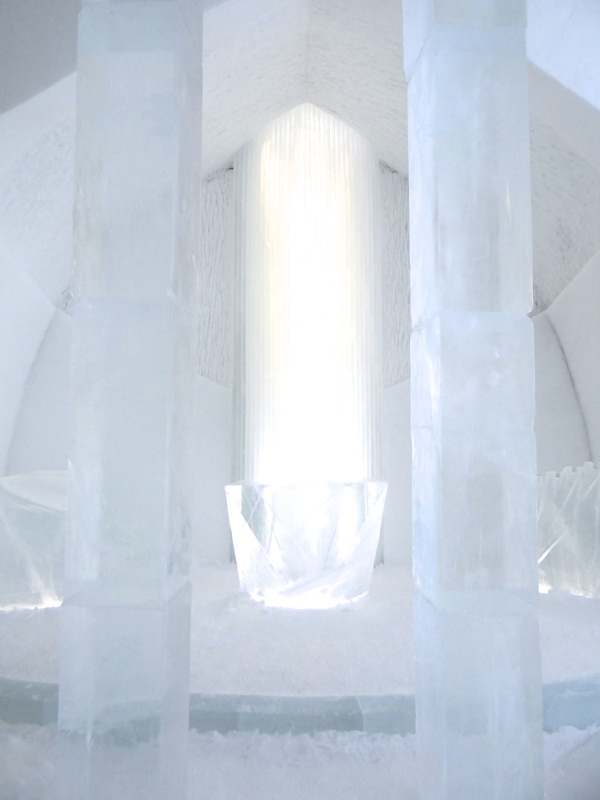 Its most famous export is the Ice Bar, in which everything – including the glasses – is made of ice. It’s a nice idea, but be prepared to pay around £35 for a glass of Laphroaig! Our first expedition to see the lights came on the first night, and it was only a partial success. It was going to be cold, so I wore every possible item of clothing I could including the snow suit, boots and leather mittens that the hotel issued to all the guests. We drove snowmobiles out into the wilderness – another first for me – and I felt as though I was further away from any sign of civilisation than I had ever been (until the streetlights came on later…!). When we stopped to look at the sky, we did see a faint, silvery glow, but we were more worried about the freezing temperatures, and I was sufficiently unimpressed that I didn’t even take any pictures. The others did, though, and they were rewarded with an ethereal green glow that showed up much better on camera than we could see with the naked eye. 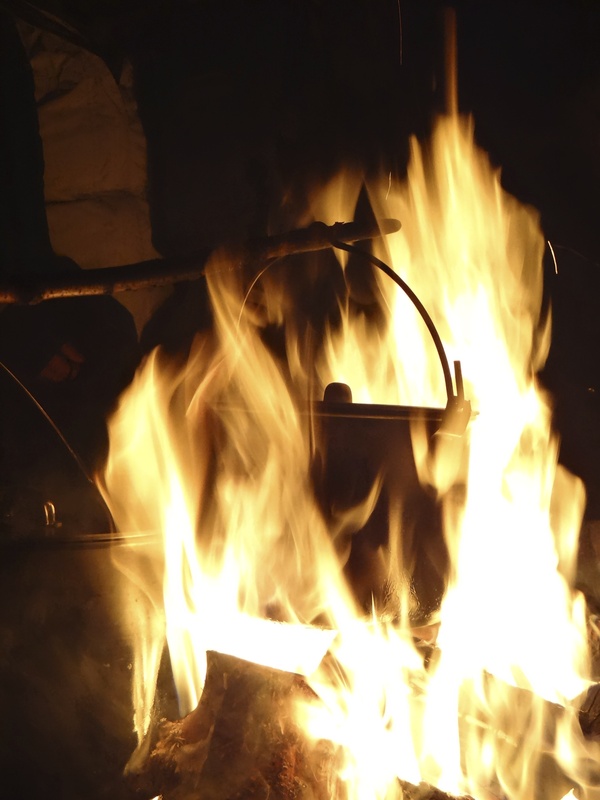 I was disappointed to miss out, but we were soon bundled off to a ‘lavvu’, or traditional tent made by the local Sami people, to warm up, dine on smoked reindeer and lingonberry juice and feed a herd of reindeer. Our guide also helpfully told us how to imitate the calls of the male and female moose…! After I broke the bad news to the rest of the party, we all went snowmobiling again and had lunch with a group of other people at a little hut in the forest on the banks of the frozen Torne. Reindeer and lingonberry juice were on the menu again, and I realised we might have to get used to a less than varied diet while we were here! The good news was that the skies were clear, which boded well for our chances of seeing the lights that evening. I hadn’t booked any activities that day, so I watched as the rest of the group went off dog-sledding and ice-sculpting. Fortunately, the hotel had a wi-fi network, but, unfortunately, it didn’t work in the restaurant, so I had to have another disappointing cold breakfast and then traipse across to the ‘warm bar’ to read the papers and catch up on the news. I also collected a special ‘diploma’ from reception to commemorate my stay and record the outside and inside temperatures during the night. That evening, we had booked a table at a very smart restaurant just down the road called The Homestead. We kicked off with champagne and nibbles in our (warm) chalet and then walked to the restaurant. I got separated again and almost got lost (! ), but it was certainly worth the trip. The food was excellent, and it was nice to be able to take off our snowsuits for a change. The minibus driver was Christopher, the same chap who had led us snowmobiling, so Amanda and I had a bit of a chat with him in the front seats as we drove north. After five or ten minutes, I looked out of the window on my side and saw what I thought must have been the northern lights, so I asked Amanda to have a look. “No, it’s just light pollution,” she said. After another few minutes, I still wasn’t convinced, so I asked our driver. “No, it’s just the ambient light from the town,” he said. He got out of the minibus and almost immediately came back to tell us the news. We all piled out excitedly and started fiddling with whatever expensive digital cameras and tripods we had with us. I set my ISO rating to the most sensitive I could and took a shot of the lights. Nothing. I took another shot. Nothing but a black screen. I took a dozen more, and every time the same result. This was not good. After all this effort, not to be able to take any pictures because my camera wasn’t good enough! I was getting worried – particularly when the other photographers seemed to be having no problem at all capturing the moment. After a few minutes, the display died down, and we drove on a few miles to another lay-by. This time, the green lights were vividly visible to the naked eye, and I set up my camera and tripod again in the hope of salvaging something at least from the trip. Amanda was next to me, and she suggested setting the ISO to 1600 or less. “You mean 16000?” I queried. I thought it was a bit bizarre to use a less sensitive setting, but I thought I’d try it. It was better than nothing. And, lo and behold, the first picture I took showed a brilliant green sky above the snow! We met the others later on back at the hotel, and it turned out that they had seen the lights, too, from the Aurora Balcony. That was good news, and I happily went to bed and spent half an hour sorting through all the images on my camera. The following morning, it had clouded over, so I couldn’t get any shots of the sunrise over the Torne, but we did have a chance to join a group tour of the Icehotel after breakfast. It was interesting to learn about the history of the place and how it was built, although I almost missed the coach to the airport when the tour overran! Disaster averted, I wended my way home. I enjoyed our trip, and I’m glad I went. My photos may not have been as spectacular as I’d hoped, but that was never going to be in my control. Rather like going on safari, you never know what you’re going to get. 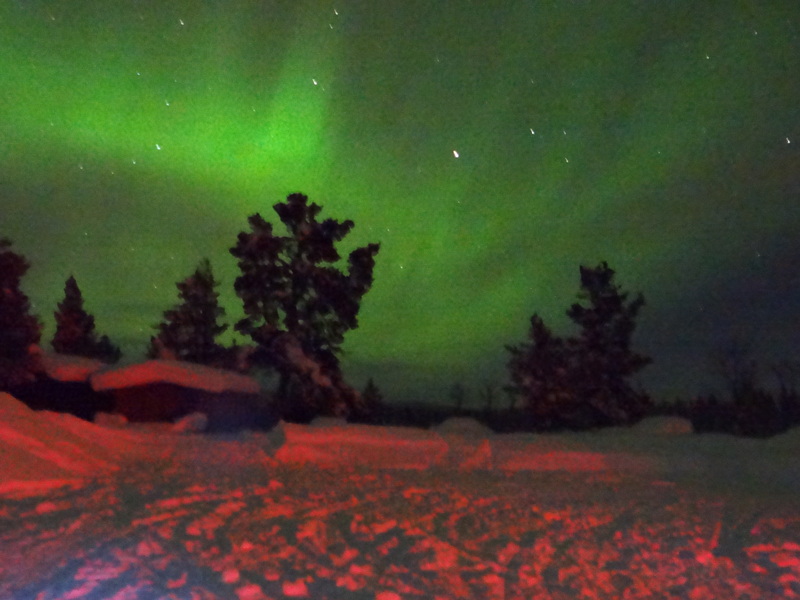 However, the combination of staying at the Icehotel and seeing the northern lights makes a good adventure. If you can stand the cold and the food and the sleepless nights and have the odd couple of grand lying around, I’d recommend it! This entry was posted in Photography, Travel and tagged aurora borealis, Icehotel, nature, northern lights, outdoors, Sweden on February 26, 2013 by Nick Dale.